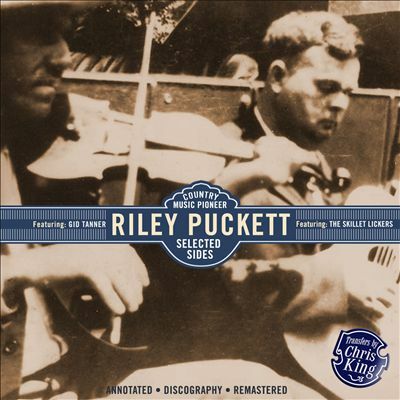 In 2011, the JSP label released Country Music Pioneer, a four-CD box set dedicated to singer and guitarist Riley Puckett. It is by far the most expansive collection ever devoted to this artist, who is usually heard and remembered as a solid member of Gid Tanner's Skillet Lickers. During the years 1924-1941, Puckett made it onto more than 300 recordings, and 100 of these have been haphazardly poured into Country Music Pioneer like wet cement into a tin bucket. Unusually for this label, the selections are not arranged chronologically, so that a handful of very early tracks (including "Cumberland Gap" and "Sourwood Mountain," which date back to the spring of 1924) were tossed into the middle of the fourth disc. Given the nature of the material, a sensible chronological presentation probably would have worked better. The focus is largely upon Puckett's considerable talent as a vocalist. A lot of the time he chose to sing slow or medium tempo pop tunes and waltzes, which in this collection generally outnumber the upbeat selections. Sentimentality was an important element in Puckett's preferred way of doing things, and it was an essential component in early 20th century popular music. Those with insufficient patience may miss the point entirely and grow restless, even though to be sure, plenty of lively and entertaining "toe-tapper" cuts are scattered throughout the mix. In addition to Puckett's excellent guitar work you'll want to listen for accordion, mandolin, fiddle, banjo, and whistling, which was one of Puckett's specialties. Let's sort out some of the highlights. "The Darkey's Wail" and "Fuzzy Rag" are guitar solos. It's a crying shame that nobody convinced Puckett to record a couple of dozen sides by himself in this way, because he was a superb guitarist, so really these are among the most valuable recordings in the entire collection. "Kimball House" and "Hop High Ladies" are instrumental duets with mandolin master Ted Hawkins, who is audible on several other tasty tracks. If you had to pick out a limited number of choice cuts, you'd also want to be sure and select "How Come You Do Me Like You Do?" "Riley's Hen House Door," "Don't Let Your Deal Go Down," "Old Joe Clark," and "I Want to Wander in the Cumberland Mountains." Attractive passages of carefree whistling occur in "Little Brown Jug" and the catchy "On the Other Side of Jordan," which like many an old-time recording made in the Deep South, contains a casually uttered racial epithet. "Curly Headed Baby" was almost certainly the inspiration for Doc Watson's pleasant modern version which may be found on Watson's album Memories, which was released in 1975. Puckett's influence on Watson has yet to be properly acknowledged. When working separately from the Skillet Lickers, Puckett was primarily a ballad singer who handled blues and pop tunes with ease. Examples of his approach to Tin Pan Alley pop include "Whistle Your Blues Away," "Get Out and Get Under the Moon," and "What's the Reason (I'm Not Pleasin' You)," which is essentially a Fats Waller cover. 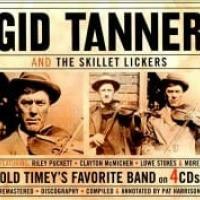 Although Gid Tanner is mentioned on the album cover, he and members of the Skillet Lickers only pop up here and there on this collection. Tanner's fiddling is most audible on disc four, and his easily identifiable falsetto singing erupts during "Buckin' Mule." The other fiddler heard in this set is cardinal Skillet Licker Clayton McMichen. Despite a comparatively calm and collected exterior, Puckett periodically sang songs with lyrics that seem entirely appropriate for a man who hung out with hard drinking hillbillies like Tanner and the Lickers. If "Bill Johnson" (with its boastful line "I'm the bully of the town") hints at this persona, "Ragged But Right" is all about gambling and habitual drunkenness, while "Nobody's Business" is laced with cheerful yet nonchalantly delivered references to morphine-and-cocaine-induced insanity, wife killing, and child slaying.